Just because they're big and burly doesn't mean that heavy-duty pickups can't also be sophisticated. 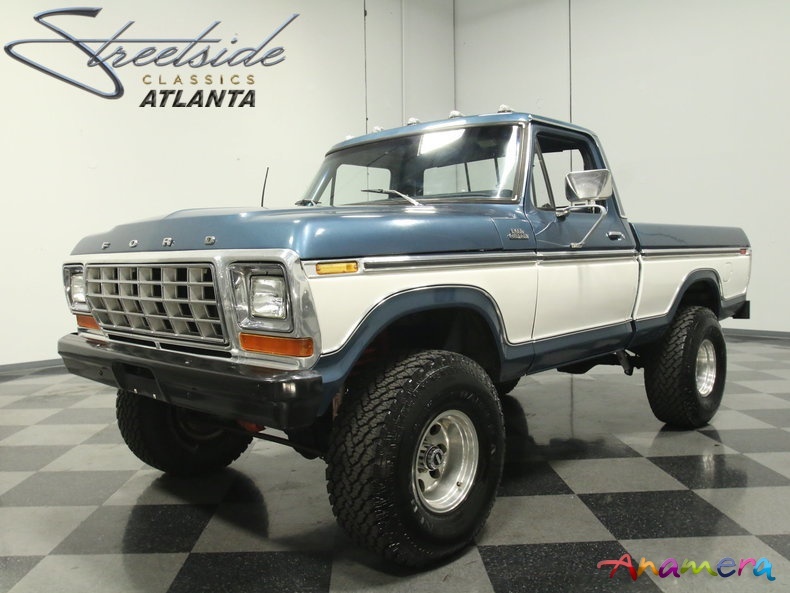 Take this 1979 Ford F100 4x4 for example. Sure, it's got the goods to go just about anywhere, but with that lovely two-tone paint scheme and a tasteful, comfortable interior, it's just as ready for a night on the town. Kudos to the owner for sticking with factory-style paint on this big, burly pickup. The original code OS Medium Blue over Silver paint would have worked just fine, but the white offers a bit more contrast and a very elegant look. No, not like a sledgehammer, but they'll notice the truck then take a closer look, saying to themselves, "Wow, that's a great-looking pickup!" It helps that the sheetmetal is in good order and the Ford's rugged looks aren't compromised by the tasteful paint. It still has big, square shoulders, enhanced by a black diamond plate rear bumper, oversized side mirrors, and a sprayed-in bed liner. It's three or four years old, so there's some use and the goal wasn't a show truck, but from ten feet away it looks very good indeed. The front bumper is also painted black, with original chrome grille above it to add some sparkle. Someone clearly had good taste when this truck was going together. Ford's Custom package offers a lot of creature comforts inside the well-appointed cab. The bench seat is fitted with a blue vinyl seat cover that's in great condition and surely a replacement piece installed quite recently. Original door panels are still in great condition for their age although the carpets are starting to show some wear. All the original gauges are still doing their thing, aided by a white-faced Sunpro tach strapped to the steering column. A smaller diameter Grant GT steering wheel adds some heft, and the rubber floor mats remind you that trucks in 1979 had not yet been totally domesticated. The floor shifter manages a 4-speed manual transmission, while the lever in the center is for the dual-range transfer case that allows this truck to go just about anywhere. A Pioneer AM/FM/CD stereo has been stuffed into the original dash where it looks right at home and sounds great, and blue neon under the dash is a neat change from plain interior lighting. Motivation comes from a 400 cubic inch V8 that was the workhorse of the F150 fleet in 1979. More than up to the task of doing some heavy work, it nevertheless is happy to trundle around town and rumble down the highway with nary a whisper. The engine bay is quite neat and clean, suggesting that while this truck can go off road, it seldom does, and it runs superbly. It's been upgraded with an Edelbrock intake manifold and 4-barrel carburetor, so it's a bit more robust than 1979 spec, and power steering and brakes are welcome additions, especially with those oversized tires. A very neatly packaged dual exhaust system with glasspack-style mufflers gives it a suitable V8 snarl, and a lift kit makes room for that butch rolling stock. The chassis is clean and tidy with everything in good working order, and you can see all the new parts on the suspension. Polished aluminum wheels have been fitted all around, along with a set of new 35x12.50-15 General off-road radials. Big trucks are red hot right now, but if you like to buck the trends a bit, then perhaps this subtle Ford will appeal to you. Call today!